Syringes and hollow needles have been used to deliver medication for more than a century. However, the precise implementation of these devices depends on the operator, and it can be difficult to deliver medication to delicate regions such as the suprachoroidal space at the back of the eye. Investigators from Brigham and Women's Hospital have developed a highly sensitive intelligent-injector for tissue-targeting (i2T2) that detects changes in resistance in order to properly and safely deliver medication in preclinical testing. Their results are published in Nature Biomedical Engineering. "Targeting specific tissues using a conventional needle can be difficult and often requires a highly trained individual," said senior corresponding author Jeff Karp, Ph.D., Professor of Medicine at the Brigham. "In the past century there has been minimal innovation to the needle itself, and we saw this as an opportunity to develop better, more accurate devices. We sought to achieve improved tissue targeting while keeping the design as simple as possible for ease of use." One location that is difficult to target with a standard needle is the suprachoroidal space (SCS), which is located between the sclera and choroid in the back of the eye. 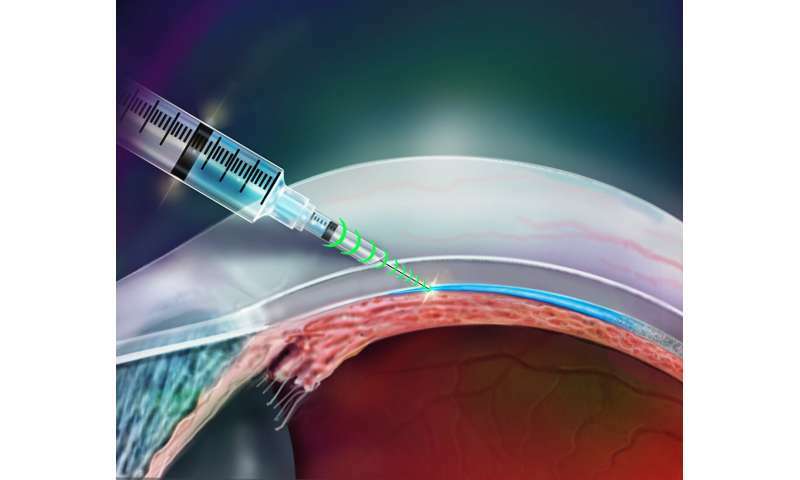 The SCS has emerged as an important location for medication delivery and is challenging to target because the needle must stop after transitioning through the sclera, which is less than 1 millimeter thick (about half the thickness of a U.S. quarter), to avoid damaging the retina. Additional common tissue targets include the epidural space around the spinal cord (used for epidural anesthesia to ease pain during labor), the peritoneal space in the abdomen, and subcutaneous tissue between the skin and muscles.